What is the LuminOx sensor? The LuminOx™ family is a range of factory calibrated oxygen sensors designed to measure the partial pressure of oxygen (ppO2) using the principle of luminescence quenching. The sensors each have an internal sensor for temperature and barometric pressure compensation. A barometric pressure sensor measurement along with the ppO2 measurement allows an oxygen concentration (O2%) value to be calculated. LuminOx™ is a digital sensor with a UART output, meaning there is no need for signal conditioning circuitry. The sensor can serially communicate the values of O2%, ppO2, barometric pressure, internal temperature and sensor status. How does the LuminOx sensor work? The oxygen measurement technique is based upon the luminescence quenching of an organometallic fluorescent dye. Due to an efficient metal-to-ligand charge transfer (MLCT) process the dye absorbs in the blue region of the visible spectrum and shows a strong fluorescence in the orange-red region. The presence of oxygen quenches the fluorescence intensity (Fig 1) as well as the fluorescence lifetime of the dye due to collisions of oxygen molecules with the dye in its excited state causing the fluorescent molecules to return to their ground state faster. Therefore, the more oxygen present, the larger the decrease in fluorescence intensity and lifetime. 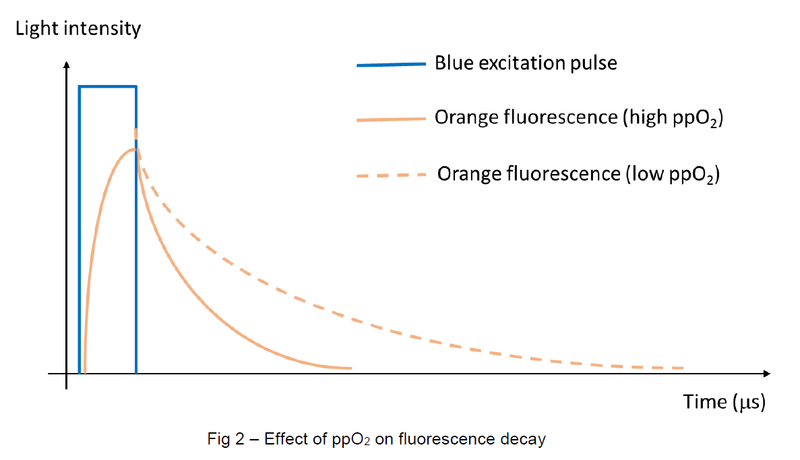 The change in the fluorescence intensity and lifetime (decay) of a fluorescent dye is directly proportional to the partial pressure of oxygen (ppO2) – see Fig 2. The fluorescence decay measurement principle is passive, reversible and robust and no oxygen is consumed in the process. 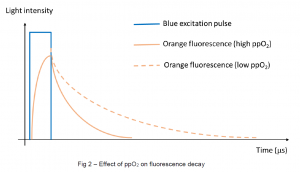 For this reason, the change in the fluorescence lifetime of a fluorescent dye with ppO2 leads to calibrated, miniaturised oxygen sensors that have a large dynamic range. LuminOx also contains an optional barometric pressure sensor, which allows the sensor to calculate and output the O2% in addition to the ppO2. ppO2 is the partial pressure of Oxygen. A partial pressure is defined as the pressure of a single gas component in a mixture of gases. Dalton’s law of partial pressures expresses the fact that the total pressure of a mixture of gases is equal to the sum of the partial pressures of the individual gases in the mixture. What is the difference between ppO2 and O2%? SST’s sensors measure partial pressure of oxygen in a gas or mixture of gases, NOT directly the oxygen concentration %. However, the LuminOx sensor has an internal pressure sensor. This is used to measure the total pressure of the sensor environment. With a ppO2 measurement and a total pressure measurement then the sensor can calculate and output an O2% value. Do I need to calibrate the LuminOx sensor? The LuminOx sensor family will need periodical calibration. The current family of sensors do not have a calibration function designed into the electronics. This means that any offset and gain must be done within the system that is reading the sensor output. Please contact technical@sstsensing.com for a copy of the application note regarding this subject. What is the LuminOx sensor output and do I need external circuitry to communicate to it? All of the LuminOx sensors have a digital output that is a 3.3V USART. The sensors internally have their own electronics. The serial output from the sensor itself means that there is no need for external circuitry and it can talk directly to another microcontroller. This allows for quick assessment of the sensor and reduces design time/cost. What applications can LuminOx be used for? • Secondary O2 sensing technology within application – used as reference to primary O2 sensor technology, for example, in 3D printing an ambient sensor may be used next to a ppm/trace O2 sensor. An electrochemical ppm/trace O2 sensor cannot be exposed to air as it will cause recovery/lifetime issues. The ambient O2 sensor is used to monitor when the door cavity is open and closed, preventing exposure. NOTE: It is important that end customers know and understand that ALL sensors drift. A suitable calibration process MUST be considered. As customer applications are outside of SST Sensing Ltd.’s control, the information provided is given without legal responsibility. Customers should test under their own conditions to ensure that the equipment is suitable for their intended application. For technical assistance or advice, please email: technical@sstsensing.com. Will LuminOx work in temperatures below zero? Yes, the sensor can work in temperature below zero degrees Celsius. It is rated to -30 degrees Celsius. The LuminOx is a solid state sensor. Other competitor technologies based on electrochemical technology will contain an electrolyte that can freeze at low temperature resulting in product failure. What are the advantages of the LuminOx technology? What is the cross sensitivity of the LuminOx technology? Minimal cross-sensitivity with other gases has been observed with the LuminOx (luminescence quenching by oxygen is highly selective). Such gases such as CO2, H2S and He have not caused issue as where they may have with other types of sensors. Though these observations are not exhaustive and customers often want to use the sensors with gas or within environmental combinations that have not been tested before. A compatibility test should always be performed using a sensor of the specification you wish to use. Once compatibility testing is complete, the sensor should be tested in accordance with its operating procedure to ensure it remains functional and within specification. If the sensor passes its functional test, then the gas can be considered to be compatible with the sensor. Please note that the environmental conditions for the sensor should be non-condensing, surfaces need to remain clear to operate correctly and some gas content may also be corrosive if allowed to condense. Also, there has been note of strong vapours physically affecting the LuminOx sensor and causing it to drift. Which sensor from the LuminOx family do I need? The LOX-02, LOX-02-S and LOX-02-F are gaseous optical 0-25% oxygen sensors from the LuminOx™ family. All three sensors are of similar technical specification and are differentiated by their housing design. LOX-02 = Original diffusion type; base is NOT sealed. Designed to be immersed completely in the sample gas environment. Note, the base of the sensor is not gas-tight. LOX-02-S = Sealed diffusion type. Mechanical size change; base has been sealed. The sensor’s face with the protective membrane can be in the sample gas environment, while the base can remain external to the environment. LOX-02-F = Flow-through type. Different housing style; base has been sealed. Allows for the measurement gas to be sampled into the sensor from the process environment. This design has improved the sensor response time to <10s, at recommended flow rate. The gas flow should be filtered to ensure a clean gas sample. The LOX-02-S and LOX-02-F are improvements upon the original LOX-02 housing design. Sealing the base allows for flexibility in positioning the sensor, particularly when closed-loop sampling is required, or there are space constraints. Dimensionally all three sensors are different, however they all share the same footprint and electrical pin-out. There are no software changes, so it is possible to use a LOX-02-S or LOX-02-F in place of the older LOX-02. What is the effect of ambient pressure / altitude changes on the output of the LuminOx? The LuminOx has pressure compensation. It relies on an internal pressure sensor to provide a total pressure value to allow the O2% to be calculated. This pressure sensor provides compensation to any pressure changes, though the range of this pressure sensor limits the sensor’s O2% output. The luminescence sensor itself measures the partial pressure of oxygen (ppO2) which is currently a 0-300mbar range. There are cases where the customer may only have interest in the ppO2 measurement and will operate the sensor outside the barometric pressure sensor range (500 to 1200mbar). Operating the sensor outside the pressure sensor’s range will cause the sensor to flag this via the ‘sensor status’ value. Please ask techincal@sstsensing.com if considering using the sensor outside the pressure sensor limits. Does the LuminOx consume any oxygen during operation? No, it does not consume any oxygen during operation. Other types of oxygen sensor technologies can have the effect of consuming the oxygen during operation. Can I get a 100% O2 sensor range? Currently SST does not have a 100% O2 sensor. However, SST does have a roadmap and does capture all customer requirements. Information supplied by customers directly drives the development of new sensors. Please contact technical@sstsensing.com with your request and specification detail. Can liquid or moisture affect the readings of the LuminOx sensors? The environment for the sensor should be non-condensing. There are surfaces within the sensor that need to remain clear of moisture for correct operation. If the sensor is exposed to condensing humidity then it will present an output that should be ignored until the surface is clear of moisture again. The sensor will then typically resume normal operation. Prolonged or frequent exposure to these events is not recommended. Is the LuminOx temperature compensated? LuminOxTM has a temperature sensor internally for compensation. However, if a sensor is exposed to a sudden large temperature swing then a temporary oxygen error may be observed in the sensor’s output. The sensing material inside the sensor will take longer than the temperature sensor to reach the new environmental temperature. Ideally the LuminOx would operate in a stable temperature environment where necessary changes in temperature are gradual. Are there output options other than the 3.3V USART? LOX-EVB is an evaluation board that provides a full industrial RS232, RS485 Modbus RTU or 0-5VDC output. SST does have other boards in development to provide other output options. Please contact technical@sstsensing.com with your requirement. What is the recommended temperature range for the LuminOxTM sensor? The sensor temperature range is -30 to 60 degrees Celsius. Are the sensors intrinsically safe? Currently the sensor design is not intrinsically safe. The customer would have to take on responsibility to qualify the sensor into applications with this requirement. What manufacturing traceability exists for your sensors? All sensors have their serial number stored within the sensor. This type of information can be polled from the sensor using the ‘# 1’ command. Please refer to the relevant LuminOxTM sensor user guide for the list of relevant commands. Do I need the white circular membrane on the diffusion type sensors? Yes, the hydrophobic, oleophobic membrane is designed to keep the internals of the sensor surfaces clean for correct operation. It is designed to prevent liquids and large particulates from entering the sensor housing. Please note that this does not prevent humidity getting into the sensor and condensing upon surfaces. The sensor environment should be non-condensing. Can SST liquid level switches be submerged? That depends on the type of level switch. Most optical level switches are not designed to be completely submerged in liquid. These switches are designed to screw into the vessel/pipe so that only the conical tip is exposed to the liquid. This ensures minimal intrusion into a vessel. The rear of the switch, where the cable/wires exit should be protected from immersion (occasional water splashes are OK), unless a secondary seal is added. However, SST’s POS range of switches CAN be immersed in water. POS switches with integrated cables are sealed to IP68 and the M12 connector version is sealed to IP67. Does the liquid level switch need to be in contact with the liquid to work? Yes, only the tip of the switch needs to be in contact with the liquid for detection. How do I know which liquid level switch to select? The Product Selector Guide is the best place to start. What is the application for the switch? What is the liquid type? What are the pressure and temperature conditions? What does the output of the switch connect to or need to directly drive? Is there a specific thread size required? Please supply as much information and specification information to the team as possible, as this will help them to quickly identify the most suitable liquid level switch for your application. If your project has a large quantity requirement then that should be stated early in the communications. Ask Our Experts for their help and support. Can I measure a volume of liquid with an SST fluid level switch? No. SST liquid level switches are single point switches detecting the presence or absence of liquid. They are not suitable for continuous level measurement. Typically, the switches are used for leak detection, high or low-level detection, and liquid level control. This video provides an operation overview of the product. What is the lifetime of an SST liquid level switch? The optical liquid level switch has no moving parts. Mean time between failures for our optical switch is typically 350,000 hours (~40 years). This was calculated using the MIL-HDBK-217F reliability prediction method. These figures are based on an ambient temperature of +50°C, ground fixed environmental conditions. Which type of switch is the best alternative to a float switch? SST optical liquid level switches are an excellent alternative to float switches. Optical level switches are easy to install and simple to operate, but are a different technology. Reliability: There are no moving parts and can require less maintenance in the long term. The optical technology has a long operational life. Float switches can jam or in extreme cases break, allowing debris into the process. Save on space: Only the tip of the switch needs to protrude and be in contact with the liquid. Sensitivity: The optical switch needs minimal contact with liquid for the switch to operate. Float switches generally need a substantial level to do so. Design Time: Our switches are designed to operate in a wide variety of liquids and environments. Different output drive options allow connection to almost any type of load: from low power indication of liquids to a microcontroller operating on a 3V3 supply; to directly driving a motor, pump or relay operating at up to 40Vdc. This can mean you have less design work to do and the switch itself can drive specific load connected to its output. Converting to optical technology should be a simple process, but not necessarily a drop-in replacement. For example, SST liquid level switches work with a regulated DC voltage supply whereas many float switches can operate with an AC mains voltage. SST has the widest range of optical liquid level switches to meet your application requirements and our technical team are happy to help you integrate them into your system. If you would like to Ask our Experts for some advice, please supply as much application and specification information to the team as possible as this will help them to quickly identify the most suitable level switch for your application. Are there any level switches suitable for food grade applications? Yes. Many of our switches are available with housings made from TrogamidTM CX7323. This material is NSF approved for food and beverage applications. Is there a level switch suitable for fuel? Yes. Switch housings made of TrogamidTM are best for petrol/gasoline. Switch housings made of Polysulfone are best for diesel. However, sometimes commercial fuels contain some extra unknown additives which may change how they affect our products. It is recommended that you always test the suitability of the material for your specific application. Please refer to the Installation, Operation and Compatibility Guide for information on materials and suitability of the switches. Suitable alternatives to the plastic housed switches would be either the Optomax Industrial Glass (“LLG”) or POS switch ranges. Both of these have glass sensing tips and stainless-steel housings. Do the sensors need to be calibrated after installation? We recommend the the customer performs zero point calibration once the instrument is installed in the final instrument. Installation can involve soldering, drilling and other operations around the sensor that may deposit dust/dirt/particulates on the gold optical reflective surface of the sensor which can change the Zero Point. If a customer wanted to calibrate the sensor in the field - what is typically done for this scenario? Zero Point Calibration should be performed periodically to ensure accuracy of the sensor. For the COZIR Ambient sensor, this can happen automatically in many applications using the build in auto-calibration function. The COZIR software user guide gives information on manual calibration methods for when the auto-calibration function is not suitable. What is the auto calibration function? Customers often require an auto calibration setting that involves an initial auto calibration after a short period of sensor power on, for example 24 hours, then periodic auto calibrations, for example 8 days. This is often requested since the installation of the sensor is often done by a third party out with the control of our customers and can be traumatic to the sensor. The short initial calibration will ensure that any dust, dirt and any other contaminants that can affect the optical coating – and therefore the reading of the sensor – will be nullified from the sensor readings within a short time of installation. The 24 hours / 2 week calibration settings are standard settings, and will activate each time the sensor is powered on. The initial auto calibration will take place after 24 hours of power on, then the next auto calibration will take place 8 days after the first. If power is interrupted to the sensor, the auto calibration counter will start afresh, with an initial auto calibration after 24 hours. If you cannot guarantee that the sensor will see a known minimum value, then you should not use the auto calibration function. How does the auto-calibration function operate? 400PPM when it read the lowest CO2 value. The auto calibration target of 400PPM is user configurable. The auto calibration will pick the lowest point in the last eight days and no matter what is the concentration, it will assume it was 400 ppm. At the second 8 days, if the lowest point back to 400 ppm, the error will be gone. If the application is in an environment that will never see outside levels of CO2, or another fixed CO2 level that the user can input, then it is not recommended to use auto calibration. An example of this would be a building that is continuously occupied. There are other methods of calibration if auto calibration is unsuitable. What is the warm up time of the sensor for instant readings and then more accurate reading? Instant readings are available after 1.2s. Instantaneous results are relatively noisy, so we have a digital filter (low pass) which gives a smoother signal. I would typically recommend power up for 5s to get a smoother signal, but the longer you power up (with a longer digital filter), the smoother the signal. It will depend on your application. We have a number of customers who use only the instantaneous result from the sensor, but they will typically add some signal processing (e.g. a simple running average) to reduce the measurement noise. 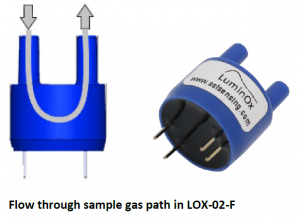 Pressure affects all optical based gas sensors. The sensor is compensated for pressure during calibration against 1013mbar. When working around atmospheric pressure you can apply a relatively simple pressure compensation factor. For operation at pressures <900mbar or > 1100mbar and where accurate compensation is required then contact our engineering team for technical advice. GSS sensors are fully temperature compensated and we calibrate each sensor individually using a wide range of gas concentrations and do this over the full operating temperature of the sensor. No further temperature compensation or correction is required by the end user. The analogue output is an RC smoothed 8 bit PWM signal. It is scaled to the supply voltage for the sensor. GSS tests the sensors at 3.3V and therefore recommends this supply voltage. While we do sell analogue sensors, we always recommend the digital sensors over analogue. With digital communications you get more resolution in your measurements compared to the analogue and have access to more commands for zero point calibrating the sensor. What is the maximum voltage we can supply the sensor? The customer can supply the standard COZIR sensor with a maximum of 5.5V. However if an analogue output is used, the absolute maximum is 5V. Note, regardless of the supply voltage the UART output from the sensor will still have a max voltage of 3.0V, this should be considered when connecting the sensor output to another electronic interface with regards to system Vih. i.e. a level shifter may be required to interface the sensor with a 5V system. The peak current is 37mA +/- 1%. This is the maximum current while using the absolute maximum supply voltage of 5.5V. What is the minimum voltage I can supply the sensor with? Our standard CozIR sensors require a minimum supply voltage of 3.3V. A supply voltage of less than 3.25V may cause an error in the readings from the sensor. The drift is application specific, therefore we cannot specify a figure. A dusty environment will cause the sensor to drift faster, for example. Customers typically use Auto Calibration on 8 Day or 2-Week cycles and get good results, however the customer would need to do trials to determine the amount of drift. Customers who cannot use Auto Calibration can implement their own version. This does not involve loading in parameters on each power-on as suggested, but instead relies on the controller storing the lowest Z output from the sensor. An unoccupied space will drop to background levels of 400ppm, and so the controller can use the ‘F Command’ of the sensor to correct the Zero Point of the sensor based on a historic low point – i.e. if the lowest point seen over a 2 week period was 419ppm, the controller can send “F 419 400\r\n” to the sensor to correct the Zero Point before starting a fresh recording period. The accuracy would be +/-5% of the reading and then +/- 70ppm. For example, at 10,000ppm, the accuracy of the sensor would be 5%*10,000ppm +/- 70ppm = +/-500ppm +/-70ppm. So the measurement could be between 9430ppm and 10570ppm. desiccants to reduce the moisture content locally. Please note that 98% RH is outside of our sensors’ normal operating conditions (0-95%, noncondensing). Answer 2) The MinIR sensor does not contain a specific water vapour correction facility. The sensors detect CO2 using optical measurement, and it contains a highly polished reflector. Several of our customers use our sensors in these circumstances. In all such applications, they have to take countermeasures to ensure that condensation does not form on the surface. Using these methods, our sensors are used successfully in Scuba diving apparatus and in breath measurement; however, it does take some care in the system design.